Contact the owner Lou @ 519-238-1285 or loumar@gmail.com. Most forward is a door to a split anchor locker and a large V-berth with shelves along both sides and three storage areas below and storage drawers. Aft to port is the head with shower grate to shower holding tank with 12 volt pump and switch. Also a stainless sink and teak mirror. To starboard is a hanging locker where the Cruiseair air conditioner is mounted with storage beside and below. Aft to port is a double settee suitable for sleeping two and a shelf for a TVComputer. A dining table is stored along bulkhead that swings out for use in two positions for two to four diners. To starboard is a single settee also suitable for sleeping. Aft to port is the U-shaped galley with double stainless sinks, stoveoven, dish rack and storage. To starboard is the chart table that doubles as counter space for the galley. The fridge top opening is aft of the chart table. Storage is mostly in this area with more under port settee and below teak and holly sole. Water storage is below both settees. Engine access is aft of companionway steps. There are two large lazarets in the cockpit for storage and batteries. Galley: E-Z Kold 12v cold plate DC refrigerator Double stainless steel sinks Foot pump backup for freshsea water 12v pump for water taps Spice racks Wine rack Wine glass rack Teak cutting board Origo 2 burner stove and oven. Electronics: Garmin GPS Map plotter with depth finder Digital programmable thermostat for fridge Standard VHF with RAM extender Foruno 1621 Radar WP5000 autopilot Electrical 2- 6v gel cell starter batteries 4-6v AGM House batteries Xantrex 2000 watt inverterbattery charge Xantrex Link 1000 for house batteries Link 10 for solar panel output 2-50' 30A shore power cables 2- 85 watt Kyocera solar panels BlueSea Solar panel boostercontroller All interior lights changed to LED’s Cruisair Air conditioner Macerator pump for offshore pump out. Deck: Lofrans Manual Windlass Boom brake Bimini and Dodger with 3 sided enclosure Edson wheel steering Cockpit Lee cloth Canvas covers for all hatches and companionway openings Cockpit cushions 2 adjustable seats Swim Ladder Jack lines port and starboard Bruce anchor with 60' of 516" chain and 150' of 58" nylon rode Delta anchor with 60’ of 34” chain and 150’ of 34” rode BBQ Teak exterior professionally done 2011. 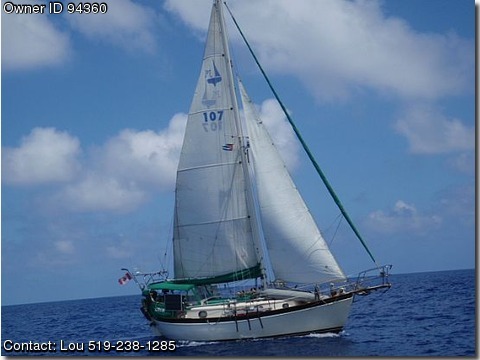 Sails and engines: 130 genoa with roller furling, Main sail full batten, Staysail 4 Barlow bronze winches Yanmar 35 HP diesel New dinghy 2010, 4hp outboard motor.